The largest project for the men each year is the Lutefisk Dinner. It takes a lot of men (and a few women) to make this dinner a success. There is also a Men's Breakfast and Bible Study every other Saturday morning during late fall - early spring. There are always projects for the guys around the church. 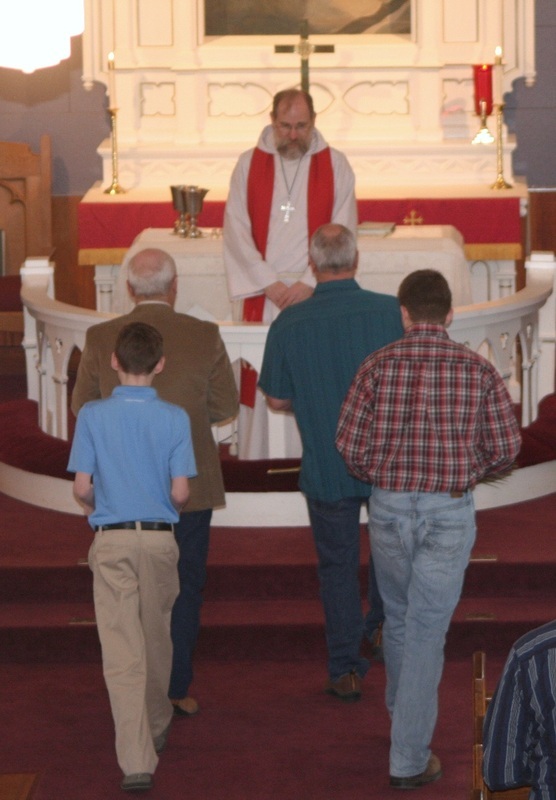 The men of Scobey Lutheran are scheduled to be Senior Ushers for two Sunday's in a row approximately once during the year. There is a description of the duties they are responsible for at the back of the sanctuary. During the school year there are two junior ushers assigned to assist them on most Sundays. If you are scheduled and cannot be there you can contact Arlo A. at 783-5685 or Gary G. at 487-2427. If you are not on the list but would like to be added please contact either of these gentlemen or call the church office at 487-2652 to leave your name. There is a large population of Scandanavians in this part of the world and they LOVE their lutefisk. People come from miles around to enjoy the dinner put on by our Men of Scobey Lutheran the last Sunday of October every fall. There is also roast turkey, dressing, mashed potatoes, vegetable, cranberry sauce, buns, and homemade pie to go along with the lutefisk. They serve approximately 600 people. The work begins weeks before with the selling of advance tickets. There is a regular crew that can be depended upon to make this a huge success every year, but they also need more men for all of the jobs to make this happen smoothly. The men use the proceeds of this annual dinner to contribute to the Church finances. The first lutefisk dinners were held when the kitchen was still in the basement of the church and the smell of that lutefisk penetrated the entire upstairs of the church when it was time for the annual lutefisk dinner. The annual dinner discontinued for many years and the church council of 1983 decided to bring it back. During the first couple of years we had lutefisk and meatballs as the main courses. The meatballs were discontinued when we realized how much work it entailed and the smell stayed on in the center and on all of us who made the meatballs for a long period of time! Turkey became the other main dish. Many of those people who were involved 32 years ago have continued to be involved. Now the dinner is much easier to organize because those same people have been willing to still do their jobs. There are several on the main committee and many, many more that faithfully prepare the turkeys, pies, gravy, dressing and potatoes. Some of the chores have become easier because we were given a potato peeler a few years ago. Remember when that group of men spent the Saturday morning of the lutefisk dinner sitting in a circle, visiting and peeling hundreds of pounds of potatoes? Many of those men and women who helped are no longer with us. The dinner in 2013 made the largest profit in 15 years. We have been able to keep the prices the same during the past several years because we feel that the money is nice but more importantly is the involvement of so many of our church family of all ages. Women in their 80's are still willing to make pies and buns and we get the youth here to serve as waiters. It's a win, win situation! Thanks to all who help make this dinner a success each year--we are truly blessed. Set your alarm for 7:00 AM Saturday morning at least two Saturdays a month during fall, winter and spring. You can sign up to make breakfast for the men and bring your friends to join in the Bible Study to follow. Last year the study was on Ecclesiastes. This will start up again in the fall when the work is nearly caught up.